The Vanderbilt Greek community is proud of its history and equally excited about the future. Our fraternities and sororities are full of men and women who will contribute to our organizations, the campus, and the Nashville community. Despite what you may hear or see on television, Greek Life is more than just a party scene. It is a balance of scholarship, service, social, and sisterhood/brotherhood. Greeks at Vanderbilt consistently achieve higher academic standings than our peers, and participate in a variety of other campus organizations and events. We invite you to learn more about our three councils, and their member organizations. The leadership, philanthropic and service opportunities that fraternities and sororities provide both on campus, and within the Nashville area can not go unnoticed. Many of the leadership positions on campus are held by Greeks. Fraternity and sorority members at Vanderbilt donated nearly $400,000 to charitable organizations last year, and participated in over 50,000 hours of community service. 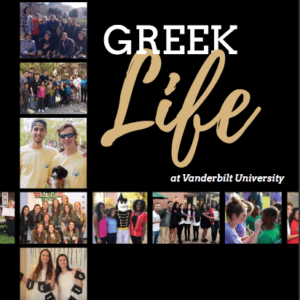 Interested in learning more about the Vanderbilt Greek Community? Please click the image above to view the digital version of our Guide to Greek Life. First year and transfer students will receive this document in their welcome bags. Students are welcome to come by our office in Sarratt 207 to pick up a copy as well!